It wasn’t long ago that we all rode triple front chainrings on our mountain bikes. Then the industry switched primarily to double chainring setups. That trend has continued with the shift toward single ring setups. What is different about this latest evolution is that it’s not just about mountain bikes. Many cyclocross, gravel and road riders are also ditching their second ring. Here’s what you need to consider before you make the switch. Will a single ring drivetrain give you low enough gears? One of the most common complaints of cyclists who switch from a double to a single chainring setup, especially those who live in places with steep uphills, is that they no longer have a low enough gear to spin up those climbs. Many stock single ring setups, such as those that come on new bikes, default to a higher low gear than what was standard for 2x drivetrains, but this can be remedied by intentionally selecting what size front chainring and cassette you install. 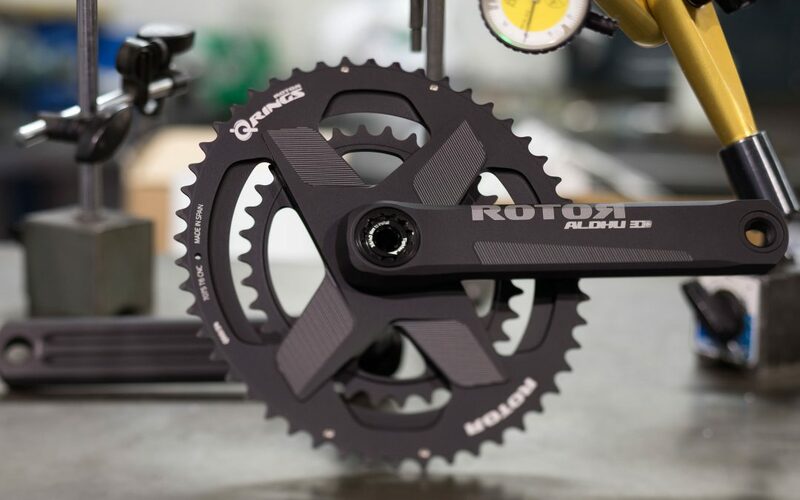 Use a gear calculator such as http://www.sheldonbrown.com/gear-calc.html to compare your low gearing options on your existing drivetrain with those for your potential new single ring drivetrain setup. Will a single ring drivetrain give you high enough gears? The opposite problem also occurs. Some riders miss their old higher gears when they’re on downhill sections. They find themselves running out of gears on the high end and spinning too much, maybe even getting dropped by their fellow riders. Again, through intentional gearing selection for your chainring and cassette, you can select a setup that gives you the high gear that you want. Remember, though, that if you opt to go with a larger front chainring to get that higher gear, it will affect your low gear, making it higher too. So you may want to solve the problem by specifying a cassette with a wider range from low to high. Use the same gear calculator mentioned above to check the high end of your new potential gearing combinations. How will having fewer total gears affect my ride? Let’s say you want to switch from a 2 x 11 to a 1 x 11. By definition, you will go from having 22 gears to 11 gears. In most double ring setups, there are duplicate or very similar gear combinations in terms of their rollout, so you’re probably not really losing 11 different gears. However, there’s a good chance that you’ll be missing a few. Whether or not you notice potential larger gaps between gears will depend what kind of rider you are. If you always require the exactly perfect gear, you might miss a few of those gears, but if you’re more flexible about your gearing, you probably won’t notice they’re gone. And even if you do notice, you may adjust over time to the new gearing in the way that a singlespeeder learns to get used to riding whatever gear he or she has. Do I need a new crankset? The answer is possibly. If you simply remove a front chainring and your front derailleur and keep the rest of your setup, you may have trouble keeping your chain seated on your remaining front chainring, especially if the chainline is not perfect. You may need to install a chain guide. You also will notice a substantially reduced range of gears from what you were used to. Sometimes it’s just easier to start over with a new drivetrain. There’s a good chance that yours is worn out anyway and needs replacing of some or all of it. Buying a single ring drivetrain will also mean you can exactly specify the gear range you’d like to have. What about my front shifter and derailleur? Good news – you won’t need these any more. You can remove them from your bike which will not only have the effect of making your bike lighter, but it will also clean up its cockpit, thus leaving more room for remote controls like those for your dropper post or suspension.